Khan’s granitic handsomeness, which first glamorized international cricket and has sustained the British media’s long fascination with his public and private lives, is now, as he nears 60, a bit craggy. There are lines and dark patches around his eyes. The stylishly barbered hair, thinning at the top, is flecked with gray, and his unmodulated baritone, ubiquitous across Pakistan’s TV channels, can sound irritably didactic. The moment of melancholy confession passed. Leaning forward in the dark, his hands chopping the air for emphasis, Khan unleashed a flood of strong, often angrily righteous, opinions about secularism, Islam, women’s rights and Salman Rushdie. That month he had canceled his participation at a conference in New Delhi where Rushdie was expected, citing the offense caused by “The Satanic Verses” to Muslims worldwide. Rushdie, in turn, suggested Khan was a “dictator in waiting,” comparing his looks with those of Libya’s former dictator, Col. Muammar el-Qaddafi. “What is he talking about? What is he talking about?” Khan started, “I always hated his writing. He always sees the ugly side of things. He is — what is the word Jews use? — a ‘self-hating’ Muslim. “Why can’t the West understand? When I first went to England, I was shocked to see the depiction of Christianity in Monty Python’s ‘Life of Brian.’ This is their way. But for us Muslims, the holy Koran and the prophet, peace be upon him, are sacred. Why can’t the West accept that we have different ways of looking at our religions? Those adept at playing Pakistan’s never-ending game of political musical chairs have begun to take note of Khan. 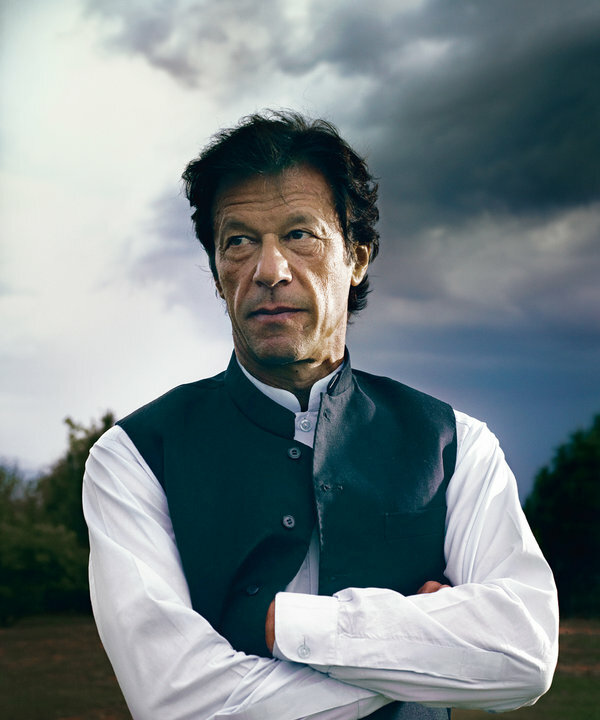 His party, the Pakistan Tehreek-e-Insaf (Movement for Justice, or P.T.I., as it is called), has never won more than a single seat in Pakistan’s 342-member National Assembly. But a recent Pew opinion poll reveals Khan to be the country’s most popular politician by a large margin, and his growing appeal has drawn together two rivals from the establishment parties — the suavely patrician figure of Shah Mehmood Qureshi, Pakistan’s foreign minister from 2008 to 2011, and Javed Hashmi, an older street-fighting politician from Punjab, Pakistan’s politically dominant province — who are now, in Khan’s hastily improvised hierarchy, vice chairman and president of the P.T.I. respectively. Khan’s campaign strategy is simple: he has promised to uproot corruption within 90 days, end the country’s involvement in America’s war on terror and institute an Islamic welfare state. His quest for a moral Pakistani state and a righteous politics is clearly informed by his own private journey.Famous in the 1980s as a glamorous cricketer, he is at pains to affirm his Islamic identity in his new autobiography, “Pakistan: A Personal History.” A rising politician’s careful self-presentation, the book fails to mention his friendship with Mick Jagger, his frequenting of London’s nightclubs in the 1980s and other instances of presumably un-Islamic deportment, like the series of attractive women with whom he was linked by racy British tabloids. It does devote one chapter to Jemima Goldsmith, the daughter of a wealthy British businessman, Jimmy Goldsmith, whom he married in 1995 — he was 43, she was 21 — but this serves largely as a backdrop for his early, self-sacrificing immersion in politics.